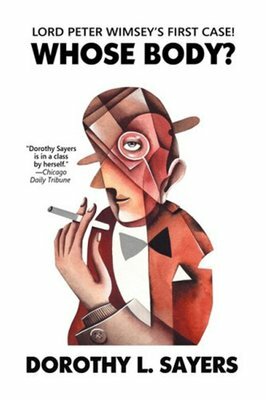 The first of thirteen classic mystery novels, Dorothy L. Sayers' Whose Body? introduces amateur sleuth Lord Peter Wimsey, whose stories have continued with an additional four novels written by Jill Paton Walsh since Sayers' death in 1957. Whose Body? starts with a naked body wearing only pince nez that may belong to a missing famous financier and ends with... well, you'll just have to read it to find out! An excerpt of Whose Body? "Oh, damn!" said Lord Peter Wimsey at Piccadilly Circus. "Hi, driver!" The taxi man, irritated at receiving this appeal while negotiating the intricacies of turning into Lower Regent Street across the route of a 19 'bus, a 38-B and a bicycle, bent an unwilling ear. "I've left the catalogue behind," said Lord Peter deprecatingly, "uncommonly careless of me. D'you mind puttin' back to where we came from?" "To the Savile Club, sir?" "Thought you was in a hurry," said the man, overcome with a sense of injury. "I'm afraid it's an awkward place to turn in," said Lord Peter, answering the thought rather than the words. His long, amiable face looked as if it had generated spontaneously from his top hat, as white maggots breed from Gorgonzola. The taxi, under the severe eye of a policeman, revolved by slow jerks, with a noise like the grinding of teeth. The block of new, perfect and expensive flats in which Lord Peter dwelt upon the second floor, stood directly opposite the Green Park, in a spot for many years occupied by the skeleton of a frustrate commercial enterprise. As Lord Peter let himself in he heard his man's voice in the library, uplifted in that throttled stridency peculiar to well-trained persons using the telephone. "I believe that's his lordship just coming in again—if your Grace would kindly hold the line a moment." "Her Grace has just called up from Denver, my lord. I was just saying your lordship had gone to the sale when I heard your lordship's latchkey." "Thanks," said Lord Peter; "and you might find me my catalogue, would you? I think I must have left it in my bedroom, or on the desk." He sat down to the telephone with an air of leisurely courtesy, as though it were an acquaintance dropped in for a chat. "Oh, there you are, dear," replied the voice of the Dowager Duchess. "I was afraid I'd just missed you." "Well, you had, as a matter of fact. I'd just started off to Brocklebury's sale to pick up a book or two, but I had to come back for the catalogue. What's up?" "Such a quaint thing," said the Duchess. "I thought I'd tell you. You know little Mr. Thipps?" "Thipps?" said Lord Peter. "Thipps? Oh, yes, the little architect man who's doing the church roof. Yes. What about him?" "Mrs. Throgmorton's just been in, in quite a state of mind." "Sorry, Mother, I can't hear. Mrs. Who?" "Mr. Thipps rang them up this morning. It was his day to come down, you know." "He rang them up to say he couldn't. He was so upset, poor little man. He'd found a dead body in his bath." "Sorry, Mother, I can't hear; found what, where?" "A dead body, dear, in his bath."